Cyclamen - a very delicate flower that will fit into any interior. A wide range of colors - from pure white to bright pink, a delicate form of flowers and wonderful decorative foliage make this plant a welcome gift. However, cyclamen are quite capricious - he needs a period of rest, careful watering and bright light. Cyclamen is often presented as a gift - this flower looks sleeker many bouquets. The age of these plants can be short - after the end of the flowering period throw them out. However, the life of cyclamen can be extended, when properly performed, a period of rest he again will delight you with flowers. Choose the right plant in the store. Cyclamen better to buy in the fall, before the active period of flowering. Choose the instance with strong stems and lots of buds. Bringing cyclamen home, place it in a permanent place - best on a window facing North. Remove the cyclamen in the center of the room - the flower needs the cool. Often ventilate the room, making sure cold air does not hit the flower. But it will be great to feel at the mode mikroprovetrivaniya. Cyclamen like temperature of 12 to 15°. During flowering watering cyclamen abundantly using only soft water. It is best to use immersion. A flowerpot, place in a deep container until the soil level, making sure the leaves do not fall in the water. Wait until the surface of the earth does not become moist, then remove the pot. 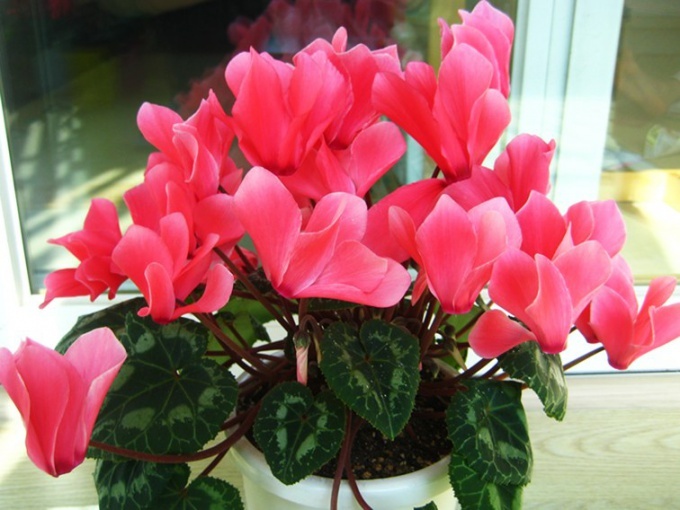 To maintain a favorable atmosphere cyclamen, set the plant on a tray filled with moist pebbles. The air around the flower spray daily. Never pour water on the top of the tuber from the leaves rot and the plant dies quickly. After the end of the dormant period the plant should be transplanted. Pick a moderately light soil is best to use ready mix for cyclamen. Start intensive watering, but fertilizing, wait until the formation of new buds. One of the main problems of cyclamen - the reduction of flowering period. Most often the cause of the rapid fall colors and the lack of new buds is incorrect watering, too high room temperature and dried air. Carefully follow the watering and time to fertilize the plants. Are ready made industrial fertilizer designed for this species - plant liquid or powder according to the recommendations on the package. Dry air and direct sunlight can cause yellowing and leaf fall. Pritenyayut cyclamen - this will suit a bright blinds. Note that the sun not only shines, but warms and cyclamen not tolerate the higher temperature of 17 o C.
Cyclamen to feel comfortable, purchase a household humidifier. This useful tool will be of use for other house plants. Cyclamen is quite resistant to pests. Most often it affects tsiklamenovy mites resembling the dust on the underside of the leaf. The affected leaves curl and fall off. Treat the plant with pesticides useless. Tear off the affected leaves and will stop the intensive spraying.